Championship thrills for the price of monthly access fee! Enjoy UEFA Champions League and UEFA Europa League matches in special promotions offered by Plus! Football festival in Plus! Plus network’s postpaid subscribers will be able to enjoy the best club football in the world. A unique promotion has been prepared specifically for them thanks to which the fans will be able to watch the matches wherever they are and however they want! 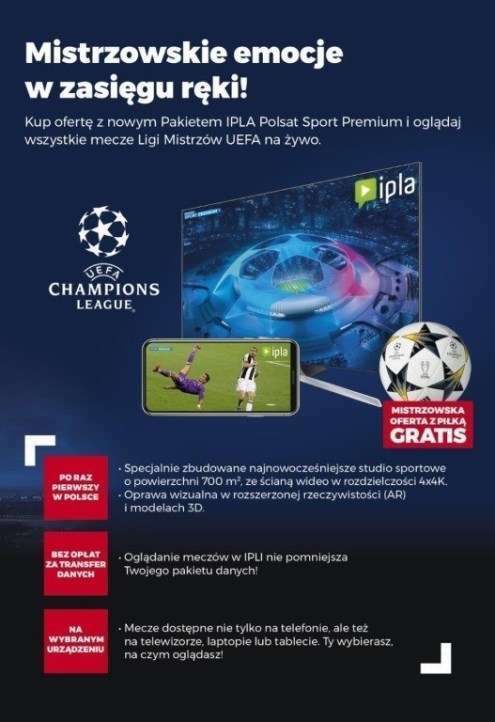 Starting July 2 the new offer from Plus will include IPLA POLSAT SPORT PREMIUM Package which offers live access in high quality to all UEFA Champions League and UEFA Europa League matches. The new offer will be available to all customers using Plus Postpaid and Plus Internet LTE services, while new customers as well as customers porting in their numbers to Plus and those who sign contract extension will be able to enjoy the offer in the new special tariffs, even for free! 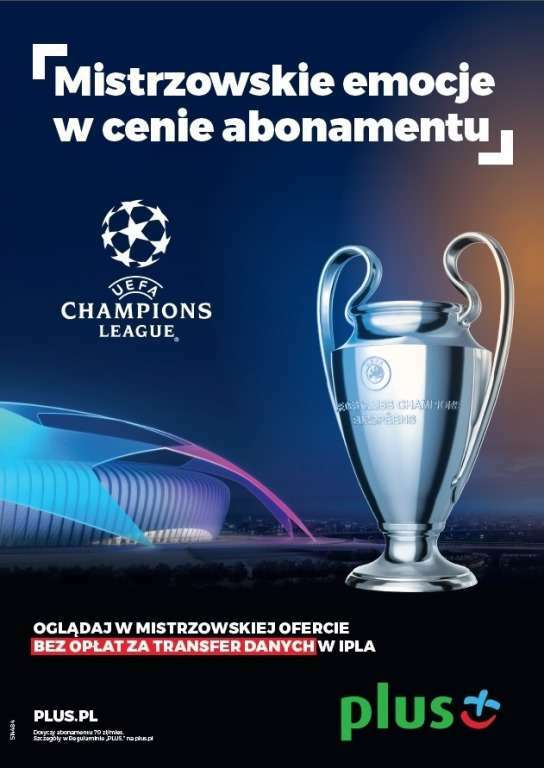 The tariffs which include bundled access to the Champions League and Europa League are Plus Abonament postpaid tariff with all services offered in the unlimited option and with Internet Bez Końca (Unlimited Internet Access) for PLN 70 monthly as well as Plus Internet LTE tariff with the 100 GB data bundle and Internet Bez Końca (Unlimited Internet Access) for PLN 90 monthly. Though Champions League and Europa League group matches will take off only in September, the qualifiers for these most exciting club football tournaments will start already a week from now, while Plus is launching special promotions which will guarantee unforgettable thrills from watching top class football. All the UEFA Champions League matches, starting from the last qualifying round, as well as the UEFA Europa League matches from the group stage onwards will be available in a dedicated service offered by IPLA - the biggest Internet entertainment platform in Poland. Starting August 21, i.e. from the first play-off round matches all the way until the final match played on June 1, 2019 at the Wanda Metropolitano stadium where Atletico Madrid plays its home matches, 38 best clubs from Europe will be competing for victory in the 27th season of UEFA Champions League. Fans will be able to follow all the events while using IPLA POLSAT SPORT PREMIUM dedicated package. It is also there that the matches played in the other European cup, the UEFA Europa League, will be shown – from the group phase, which starts on September 20, to the final match played in the capital of Azerbaijan on May 29, 2019. The matches will be accompanied by special pre- and post-match programs, in-depth match analyses, opinions by experts and commentators as well as special guests. All in a purpose-built, state-of-the-art 700-square-meter studio with a 4x4K video wall and visual realization relying on augmented reality (AR) and 3D models. All this can be watched not only at home, on a TV set, but thanks to IPLA web TV, with a dedicated IPLA POLSAT SPORT PREMIUM Package, the matches will be also available via smartphones as well as laptops and tablets. New promotions, including IPLA POLSAT SPORT PREMIUM package, will be launched by Plus on July 2. The service will be available to users of all voice and data postpaid offers for the residential market, while viewing the broadcasts will not consume the subscribers’ data bundles. In Plus Abonament postpaid service, the offer with the new IPLA Package means unlimited services (voice calls to all networks, unlimited SMS’s and MMS’s, Unlimited Internet Access), roaming package for the EU and 120 minutes for international calls – all offered for PLN 70 monthly. The subscription also includes the possibility of adding, at any time, an additional SIM with a monthly fee reduced by 50%, i.e. down to PLN 35. In the case of Plus Internet LTE, the new offer with the sports package means 100 GB in the basic data bundle as well as Internet LTE Bez Końca (Unlimited LTE offer) for PLN 90 monthly! As regards the remaining customers of Plus’s offers for voice and Internet access, IPLA POLSAT SPORT PREMIUM will be available in the form of an additional package for PLN 40 monthly. The details of the offer for Plus Abonament can be found at https://www.plus.pl/abonament/przenies-numer, while the details of Plus Internet LTE are available at https://www.plus.pl/internet-lte?oferta=modemy-routery. Change to Plus and watch the world’s best footballers compete for the most important European club football trophies!